IslayBlog.com -> 2007 -> Islay Rum? Turns out this is a new venture by Murray McDavid, the independent bottler (a subsidiary of Bruichladdich). Three years ago they decided to explore rum and tracked down casks from a range of single distilleries. 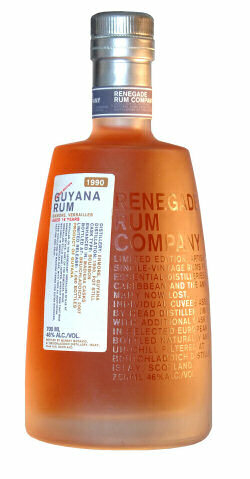 The result was the Renegade Rum Company, which offers a number of selected rums. While the rum is/ was distilled in Guyana, Jamaica and Panama it is bottled on Islay at the Bruichladdich distillery bottling facility, using island spring water to reduce it to 46%. They are limited editions, as some of the distilleries don't exist any more. As I said, I don't really drink rum, but I found this interesting enough to blog it. After all it might be interesting for those interested in Islay but not so much in whisky. Now they have an alternative to whisky, provided they like a good rum. They are now available in the Laddie Shop Renegade Rum section.